Copyright © 2006 by Diane Vera. All rights reserved. In Lafeyette, California, on Wednesday, October 19, 2005, Scott Dyleski was arrested for the murder of Pamela Vitale, wife of well-known defense attorney Daniel Horowitz. The case attracted national mass media attention, and a lot of commentators made a big to-do over the teenage defendant's alleged involvement in both Satanism and the Goth scene. The case is scheduled to go to trial on July 17, 2006. In the meantime, factual details are murky because a gag order has been imposed. However, based on what I could glean from local news media, it appears that (1) the prosecutor has stated that he is "not aware of any evidence related to Satanism," and (2) the kid seems to have dabbled in both Satanism and the Goth scene - or at least Goth fashion - but seems to have given up his interest in both by the time of the murder. Dyleski will stand trial in Vitale slaying by Ryan Huff, Fri, Feb. 17, 2006 - mentions DNA evidence. New Theory On Motive In Vitale Slaying, CBS, Oct 29, 2005. (Presents the theory that Dyleski killed Vitale because he was upset over the death of his dog, an idea dismissed by the prosecutor in this Contra Costa Times story, Nov. 17, 2005. Based on what I've been able to find online, it seems that the "Satanism" and "Goth" themes were played up quite a bit more in the national (and international) coverage than in the local coverage. Gaming, Goth and Satanism - Crossing over to the Dark Side: The Murder of Pamela Vitale by Pat Brown, who seems to think that anyone with a serious interest in either the Goth scene or Satanism - or even role-playing games, for that matter - is likely to commit violent crimes. Pat Brown calls herself a "criminal profiler," and, according to this page on AuthorsDen, she appears weekly on CourtTV's crime series I, Detective! But apparently she has not worked in law enforcement, nor does she seem to have studied any relevant academic field. She is the author of a book Killing for Sport: Inside the Minds of Serial Killers, available on Amazon, where some of the customer reviews note her lack of qualifications. In her article One Little, Two Little, Three Little Serial Killers: How many are there - really? she pretty much admits to a lack of knowledge of statistics; thus she clearly is not a social scientist of any kind. I won't deny the possibility that there can be some very good amateurs in the field of criminology, but still.... I found some interesting pages by Steve Huff and Brent E. Turvey containing some commentary about Pat Brown. A Lorraine cross by itself is not a Satanic symbol. 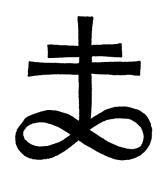 Anton LaVey did use, on the "Nine Satanic Statements" page of his Satanic Bible, a symbol similar to the one below at the left, consisting of a Lorraine cross atop an infinity sign (figure 8 on its side). But the mark that was carved on the body of Pamela Vitale was a plain Lorraine cross, not the alchemical brimstone symbol. What did it mean to the perpetrator? We don't know. Was the mark on Pamela Vitale's body symmetrical and drawn with close-to-perfect right angles? If not, then, with the angles made oblique, the "Lorraine cross" could perhaps have been meant as a mathematical not-equals sign. Only the perpetrator knows for sure what the mark was supposed to mean, if anything. For all we know, perhaps the mark wasn't even intended to be a symbol of any kind, but just some gratuitous further cuts on the victim's body. When Pamela Vitale was murdered, her husband Daniel Horowitz was in the midst of defending Susan Polk, who was on trial for the murder of her husband, Felix Polk. Coincidentally, the Polks were also the parents of someone who, as a child, had allegedly been abused in one of the alleged "Satanic Ritual Abuse" (SRA) cases involving childcare centers back in the 1980's. (See Court TV's full coverage of the Susan Polk murder trial. Some other relevant news stories include Orinda man slain amid acid divorce: Wife says he coerced her as teen by Charlie Goodyear, San Francisco Chronicle, Wednesday, October 16, 2002, and Son testifies against own mother in murder trial by Jason Dearen, Tri-Valley Herald, USA, Mar. 9, 2006. For information about the SRA scare, see my page of links about The "Satanic Ritual Abuse" scare of the 1980's and early 1990's.) Various conspiracy theorists, whom I won't bother to list here, have had a field day with this fact. While Googling on the string "Scott Dyleski Satanism," I came across the following page on what appears to be the blog of a college student taking a course in journalism: Rough, rough rough draft of article 2 by Whitney Worden, October 26, 2005. Worden defends the Goth scene but makes some unpleasant overgeneralizations about Satanism and what she calls "Satanic cults." She later posted a much better blog entry, Help?, on November 29, 2005. I also came across a bunch of blog entries in an Archive for the 'Scott Dylesky' category on The Trenchcoat Chronicles, a blog whose owner, "Trench Reynolds," says that a previous website of his was wrongly connected to the Columbine killings back in 1999. (See Foreword and Columbine Backlash, Sunday, April 30, 2000.) At least one of his blog entries, More on Scott Dyleski, Friday Oct 21, 2005, has some very interesting responses by people who say they are friends of Scott Dyleski. I've posted a reply to another of his blog entries, Hippies file charges in Dyleski search, Thursday Apr 13, 2006. Is Scott Dyleski guilty of murder? Based on the DNA evidence, it would seem so. However, even purported DNA evidence isn't necessarily infallible, so let's wait and see what kinds of objections to it are raised to it at the trial. Let's wait and see what other evidence is presented at the trial too.